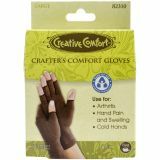 Creative Comfort Crafter's Comfort Gloves 1 Pair - DRITZ-Creative Comfort Crafter's Comfort Glove. These Comfort Gloves are a seamless, lightweight, compression glove that have a snug fit that warms and supports the hand. 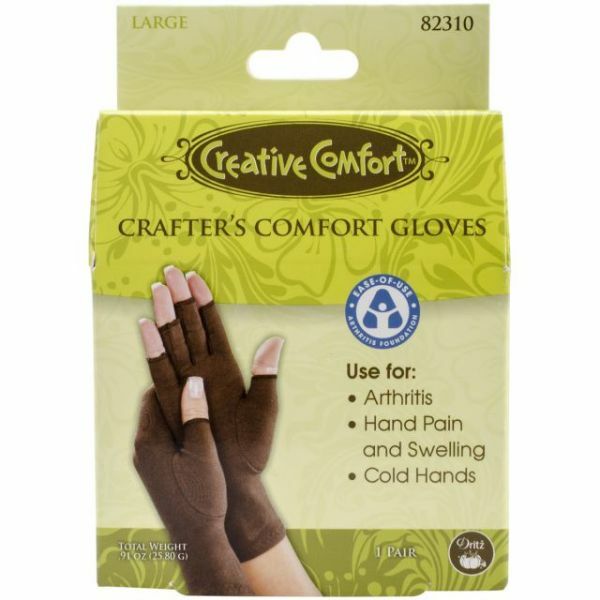 The unique design helps improve circulation, reduce swelling, and relieve arthritis pain. The soft cotton and spandex material allows skin to breathe and keeps hands dry. The open fingertips allow full freedom to feel and grip. Wear by themselves or as glove liners for maximum comfort while you are doing your favorite activities. This package contains one pair of Comfort Gloves. Available in small, medium and large (each size sold separately). To determine your size: measure the back of your hand across your first set of knuckles: small--up to 3-1/8 inches, medium--up to 3-1/2 inches, and large--up to 4 inches. Hand wash cold, air dry. Imported.